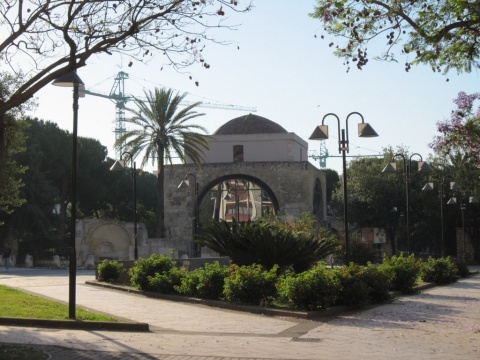 The archaeological complex of Saint Saturno is characterized by the presence of a church and a funeral area around it, which can be accessed from the current Piazza San Cosimo. The burial area is located in the northern side with respect to the church, and houses part of the necropolis including mausolea, sarcophagi, tumuli (grave mound) and tile-built tombs. The area was used as a necropolis since the late Republican Age. Subsequently, it was conspicuously exploited with the same purpose by the local christian community, although the archaeological and epigraphic evidences of that use cannot testify a continuity throughout the ancient times. The remains found at the adjacent church of Saint Lucifero bear witness of a burial use, whose link to the preexisting structures in the area of Saint Saturno and to the well of Saint Cosimo is still unknown. The burial purpose, with respect to the different uses of those areas, reveals the complex problem of their distribution and dating: in fact, some recent excavations in the area opposite the Basilica of Saint Saturnino, currently housing a newly constructed square, have brought to light a quadrangular well that lets assume a sacred function within the hypogeal worship of water.